Ian Marber, the nutritional therapist behind The Food Doctor brand of healthy food products and clinics, is a mainstay of daytime TV and magazine and newspaper food and wellbeing columns. He released his first book in 1999, and has published regularly ever since. is Marber’s latest book. It’s underpinned by the simple principle that diet’s don’t work. Marber claims that when people diet, their body experiences a famine, which it recovers from when the diet is over, storing away reserves of fat and energy to cope with the next famine. His theory is that dieting actually makes you fat, as the body adjusts to feast and famine. The answer to this problem is fairly obvious, and presented in this book. 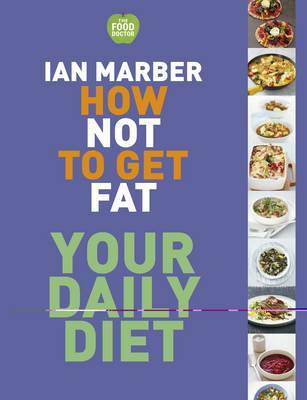 Marber proposes that instead of dieting on and off, a better approach would be to just eat well all of the time. You’ll stabilise your weight, lose it where you need to, and best of all, get to eat good food. It’s just better not to put weight on in the first place. is split into three parts, an introductory section that sets out the theory and discusses some of the assumptions and practicalities of the approach, whilst the third section sets out a few sample meal planners. The second, middle section is the most substantial and interesting, covering fifty Food Doctor approved foods. These foods are split further into proteins and complex carbohydrates. The main idea is that proteins and complex carbohydrates should always be eaten together. In essence, this normally amounts to meat and two veg. That’s a very simplistic view, but you get the idea – eat meat, fish, other proteins with vegetables. It’s fairly easy, really…just eat a balanced diet. I’m not a dieter. I’ve never been on a diet, or really thought that much about the rigours of following a set meal plan or diet. Marber’s book does strike me as fairly sensible, though. It’s central message of moderation and variety sound like very good ideas, and some of the recipes and meal suggestions described sound much more palatable than the average diet fare. There are no odd coloured protein shakes here, but there are some interesting ideas about food combination, preparation and consumption, all with a broadly healthy and, most of all, achievable edge to them. Definitely that starvation is not a solution. Thank you for the review – I will definitely check this out. I know that eating mindfully is the best way to go . . . no extreme will do it. Moderation, balance. And plenty of exercise. Calories in, calories out. Only trouble for me is that as I age metabolism is slowing and I'm still adjusting to that. I don't want that thick middle! I will definitely have to grab this book… it looks very informative. Thanks for sharing! Well sounds like common sense to me. As someone who started doing the right thing back in July, eating sensibly, 3 meals a day, smaller portions, no additives and less alcohol . . . managed to lose 2 stone in 4 months! (Admittedly I needed to!). But that's the point . .. eat like a thin person rather than a starving person! Thanks for the review! Sounds interesting… My motto is mindfulness + exercise = weight maintenance!